Prices are expected to grow 0-2% for homes on expensive land bought during the en bloc cycle. With muted price growth expectations for residential properties in 2019, no near-term catalysts for developers with large local market exposure are expected, according to a report by RHB Research. Urban Redevelopment Authority’s (URA) Q1 2019 flash estimates showed that overall property prices declined 0.6% QoQ following a 0.1% QoQ dip in Q4 2018. The high-end segment saw the maximum decline of -2.9% QoQ, with RHB attributing its susceptibility to cooling measures to a high proportion of purchasers being mainly investors and foreign buyers. With more than 50 projects in the launch pipeline, adding an estimated 19,139 units, buyers will have plenty of choices. However, this will limit developers’ pricing power. “Developers also have little room to cut prices in new launches as many are sitting on expensive land acquired during the recent en bloc cycle. As such, we expect price growth to stay flattish in the 0-2% range in 2019,” RHB analyst Vijay Natarajan said. 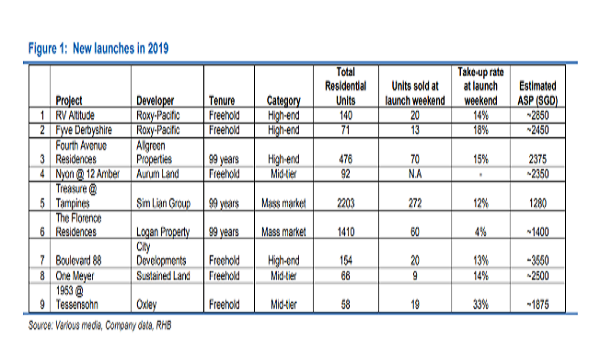 RHB Research’s analysis of new launches in 2019 showed takeup rates at launch weekends have been rather low, at 10-20%, vs 30-60% in previous years. “This is not surprising, as buyers, being price-conscious, are adopting a wait-and-see approach amidst a huge supply in the pipeline,” he said. The trend is expected to continue, with only selective projects with strong attributes and pricing outperforming the rest. Overall, Natarajan said that he expects a primary sales volume of 8,000-10,000 units for 2019. For the private resale market, RHB Research expects volumes to remain steady compared to last year on the back of en bloc sellers looking for immediate replacement homes, the spillover demand from new launches, and the release of units previously held back on the expectation of potential en bloc sales. Natarajan added that developers’ cautious bids point to a soft market ahead, with the recent land bids for Sims Drive and Middle Road sites indicating that developers are buffering in a slight 5% price decline. “Hong Leong Holdings and City Developments’ top bid of $383.5m or $732 psf ppr for the Sims Drive site translates into an estimated breakeven point of approximately $1,175 psf ppr and an average selling price (ASP) of $1,350 psf, assuming a 15% margin.”. In comparison, Sims Urban Oasis, located next to the site, has seen recent transactions made at $1,350- 1,600 psf. 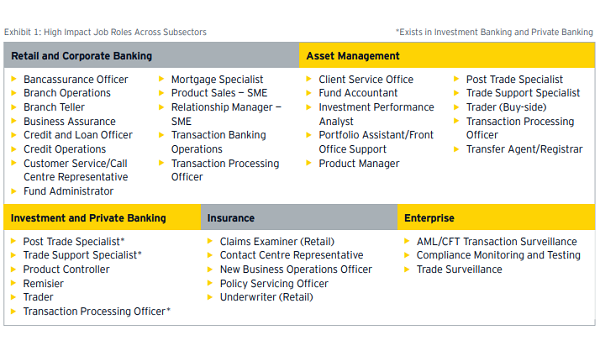 For the Middle Road site, RHB Research projected the breakeven level to be around $2,000 psf and an ASP of $2,250 psf.